Nonetheless I managed to spend 3+ hours on the plot, which now looks amazingly tidier. Unfortunately I did not sow any seeds: I find it takes a certain mood setting and preparation for me to start a sowing job; digging comes much more naturally to me when I have just scraps of time. But I did a fair amount of work, so I am pleased. I tried the smell test on the currant's cutting I planted last week, and it must be redcurrant as there is no smell from the leaves. I have continued filling the bed with more strawberry runners, and had to dig a new one for raspberries, which I also filled. The garlic bed is ready for planting and there is also an extra one behind the vines, where spinach beet (Chenopodiaceae family) was growing as self seeded plants. When it comes to rotation, I still do not know by heart the four-year scheme, let me have a look. It seems Solanaceae or night shades, and Cucurbitaceae or pumpkin family come after Chenopodiaceae: all things that can only be sown from spring onwards. I may use the bed for some salad over winter (with the exception of rocket, mizuna and other orientals which are Brassicaceae, salad is in fact outside the rotation), but I am not sure that it is sunny enough up there. 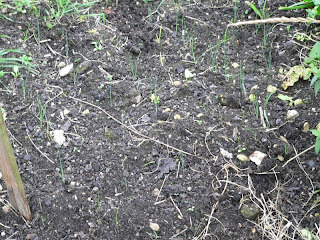 Cropwise, the leek seedlings seem to be growing, but they are still just seedlings as you can see: nearly invisible. The brassica (shush, just in case any slugs listen in) seem to be doing well and I am still getting fairly ripe tomatoes - albeit very small ones - and raspberries. I also picked three half empty cobs, whose other half was delicious. A full week to go to the next allotment time. My study should keep me busy in the meantime, and the town library supplies interesting related readings. pruning is not generally done in autumn, as this is the time of the year when most fungal spores are in the air, making it the period in which the pruning wound is at greatest risk of an infection that can be lethal. Never thought of that, but makes sense after learning that leaves have breathing pores on the underside of the blade, so as to avoid spores landing on them and getting in.